There are so many different takes on modern furniture. That’s why if you’ve settled on a modern look for your bedroom, you might feel a bit overwhelmed by all the choices. There’s Italian modern bedroom furniture, metallic, wood. If you’re not sure what to choose, you’re in the right place. We researched some of the best sets out there so you don’t have to. Before we get to our reviews, let’s look at some of the key things to consider. 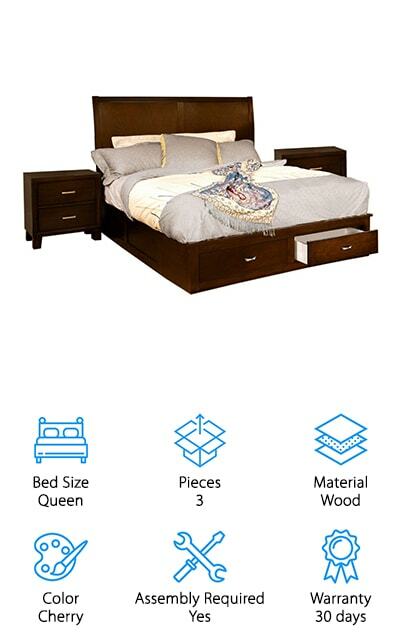 Bed Size: While you won’t find every size available in every style, these sets are generally made for beds that are full size and larger. The most popular size is queen, though there are quite a few king size options, too. Pieces: We found sets with anywhere from three to six pieces of furniture in all. Find a set that fits the space that you have. Some of the large sets really do take up a lot of room. Material: Most of these sets are made of a combination of wood, MDF, and veneer. That’s not an unusual combination. It provides a lot of strength while keeping the look and feel of solid wood without having to use it. Color: When it comes to color, these sets are really all over the place. A lot of them are available in wood tones like cherry or espresso. But you’ll also find modern bedroom furniture sets with metallic and even snake skin finishes. Assembly Required: All of these sets have some amount of assembly required. Some even include all of the tools that you need to get the job done. Obviously, the more pieces in a set, the longer assembly will take. Warranty: The warranties on most of these sets are only for 1 year or less. Some don’t have a warranty at all. Pay attention to what’s covered and make sure you know how long its covered for. Now that you know what to look for, let’s move into our modern bedroom sets review. Here’s how it works. We put out top and budget picks first. That way, if you’re in a hurry, you’ll still get a good idea of what’s out there. Stick around as long as you can, there are so many unique items on this list, you’re going to want to see them all. Okay, are you ready to get started? Let’s go! First up is our top pick, the Modway Tracy Bedroom Set. This queen bedroom set has a gorgeous mid-century design that adds a bit of sophistication to any space. 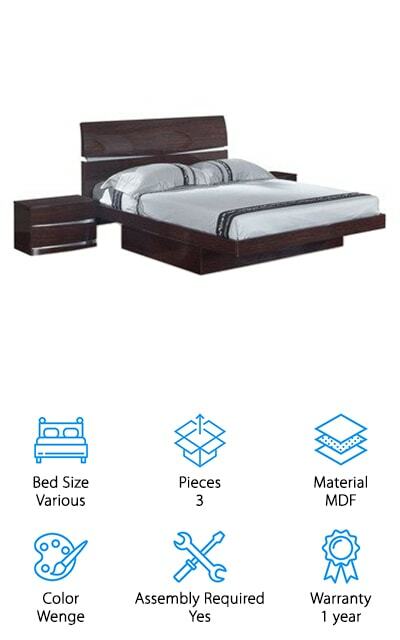 The bed is constructed using wood and MDF. It’s accented with splayed legs and does not require a box spring. The frame was designed to provide the right support to a mattress and can hold up to 600 pounds. That’s not all, the headboard is upholstered in soft brown polyester fabric. The bedside tables and dresser share the splayed leg design. All of the pieces also have rounded corners which provides the perfect contrast. The nightstands each have two easy-glide drawers while the dresser has three, all featuring round matching wooden drawer pulls. The fifth piece in this set is a large mirror that looks awesome above the dresser. If you’re looking for a contemporary bedroom set on a budget, this one from Furniture of America might be the one for you. 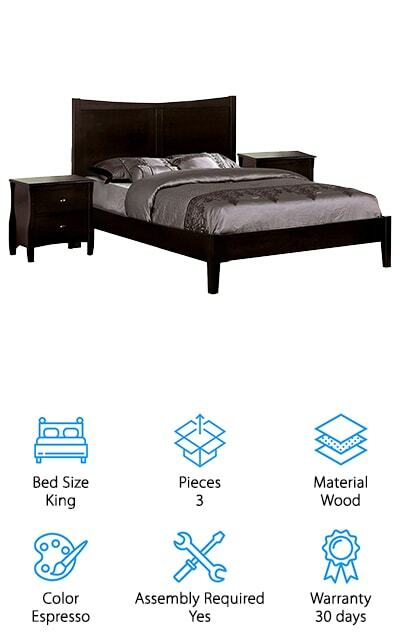 It includes a queen sized bed with a large, two panel headboard and two matching nightstands. One of the best things about this set is it also adds a lot of storage. The bedside tables each have two spacious drawers where you can stash your reading glasses or favorite book for bedtime. Plus, there are two additional drawers at the foot of the bed, the perfect place to stash an extra blanket so it’s close by on cold nights. All of the pieces are made of wood and wood veneer and have a cherry finish. That’s not all, the nightstand feature brushed nickel drawer pulls that really pop against the dark wood grain. Next up is a unique contemporary set from HOMES: Inside + Out. 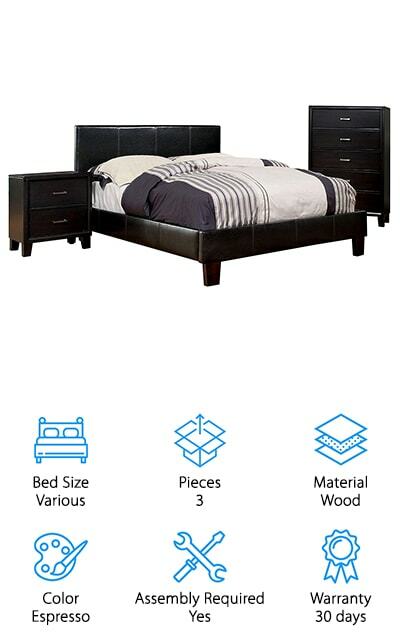 This set includes a bed, nightstand, and chest of drawers. The bed is available in a range of sizes, from full all the way up to California King. Both the bed frame and the headboard are upholstered in padded black faux leather that has beautiful stitching details. A slat kit is included so there’s no need for a box spring. The bedside table and chest are constructed of solid wood and veneers and finished in a deep espresso that matches the leather on the bed. Both the nightstand and the chest feature wide, chunky feet. The nightstand has two drawers, the chest five. Each drawer has long, thin shiny silver drawer pulls that add a nice eye-catching pop of brightness to the set. If you’re looking for a king bedroom set that’s ultra-modern, take a closer look at the Global Furniture Aurora Bed Set. It includes a bed as two bedside tables that share the same, sleek curves and clean design. The headboard is composed of separate horizontal panels, each with a deep espresso finish. Between the panels is a bit of silver metallic which adds a gorgeous little bit of brightness and shine. The bottom consists of a low, flat rectangular base with an overhang frame for the mattress. As for the bedside tables, they echo the headboard with a band of shiny metallic under each drawer. Everything is made of wenge, MDF, and wood veneer and has a curved, clean contemporary look. It goes well with a variety of different decor. It even comes with a 1-year warranty. Next up is this beautiful modern bed set from GTU Furniture. 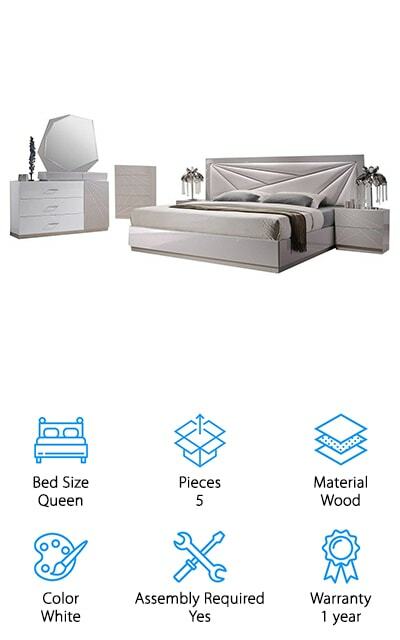 Not only do you get a full queen bed with headboard, footboard, and rails, it also includes a nightstand, dresser, chest of drawers, and mirror. Every piece is made of wood, veneers, and MDF. The bed is really the focal point of this set. The frame and headboard are upholstered in faux leather with the headboard featured a cool, square design that gives it the slight appearance of tufting. As for the rest of the pieces, the dark brown finish matches the bed upholstery. This set comes with a lot of storage. The nightstand has two drawers, the dresser six, and the chest five. Each one is accented with a long, thin chrome drawer pull. Some assembly is required but all the tools and hardware are included. 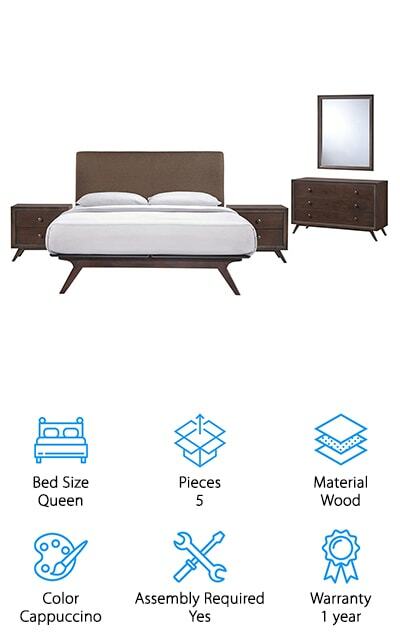 The Furniture of Americas Essos Set includes a king-sized bed and two matching nightstands. The headboard is really unique. To stand out against the straight, simple lines of the rest of the bed, the headboard as a downward sloping top. That’s not all, this curved line is echoed in the nightstands that hand legs that have an outward slope. Each nightstand also has two large drawers that are made to be extra sturdy as well as bright nickel drawer pulls. The pieces in this set are constructed of solid wood and veneer and all have a deep espresso finish. Although this set has a distinctly modern flair, it’s subtle design would look great in any bedroom. A slat kit is included which eliminates the need for a box spring. It also comes with a 30 day warranty. J&M Furniture’s Knotch Set has a look all its own. It’s made of plantation grown solid wood that’s really sturdy and durable. 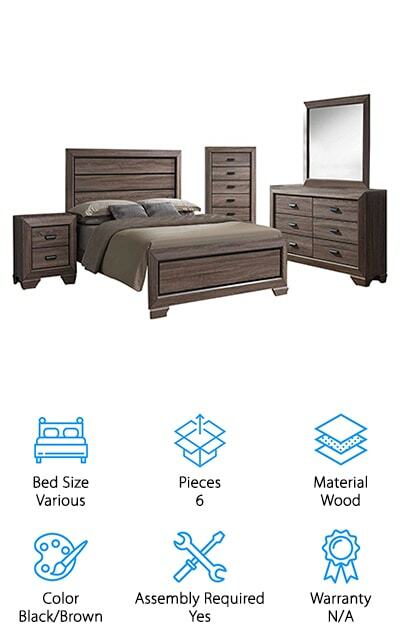 This five piece set includes a platform bed, nightstand, chest of drawers, dresser, and mirror. All the pieces are done with a deep, dark espresso finish which is warm and welcoming at the end of the day. The simple platform bed has a headboard with a simple notch cut out just below the top edge. This element carries through to the other pieces, too. Between each drawer on the nightstand, chest, and dresser is the same notch that goes from one side, across the front of the piece, and down the other. It creates an interesting effect that makes it look like the pieces are made of various drawers stacked on top of one another. If you’re looking for something a little different, take a look at the Best Quality Metallic Bedroom Set. 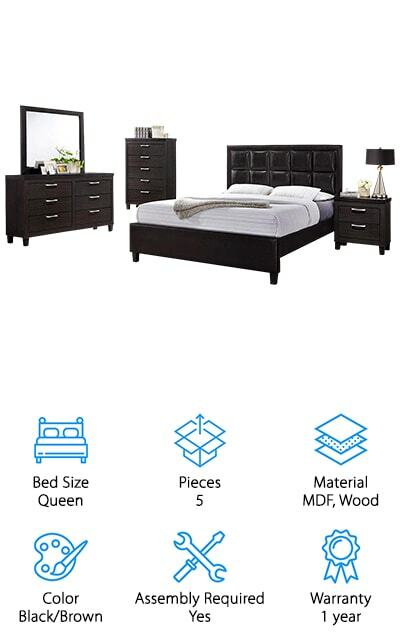 This set features a queen size bed, nightstand, chest of drawers, dresser, and mirror. The bed frame is upholstered in faux silver leather with an intricate tufted design. Around the perimeter of both the head and footboards is a mirror-like frame which also appears around the edges of the nightstand, dresser, and chest. The surfaces of all the furniture have the appearance of silver snakeskin, which is definitely an intriguing design element! That’s not all, the headboard and nightstand even have built in LED lights for a hint of added sparkle and shine. All of the drawer pulls are made of metallic handles, too. A slat kit is included but you can use it with a box spring if you prefer. The Florence Bed Set from J&M Furniture is an interesting take on Italian bedroom furniture. One of the things that stands out the most in this set is the headboard. It’s upholstered in white leatherette material. The design consists of large, triangles formed by stitching originating from the top corners and head toward the bed. The mattress sits on a simple platform bed frame that’s finished in white and taupe lacquer. 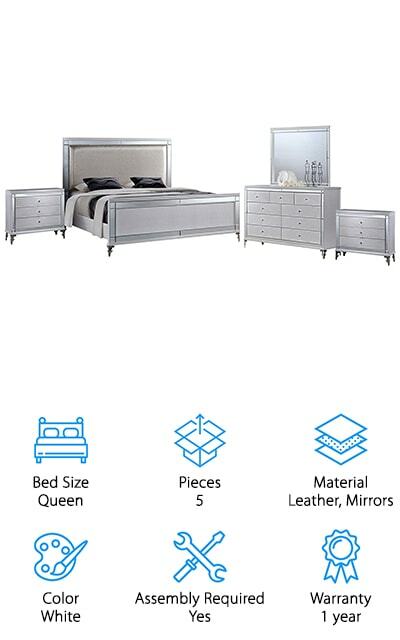 This set also includes two nightstands, a dresser, and a mirror. The angled details of the headboard also appear on the front of the nightstand, chest, and on the right hand side of the dresser. That’s not all, the mirror even has echoes of the angular theme but in a more symmetrical manner. If you’re looking for something truly unique, take a closer look at this set. 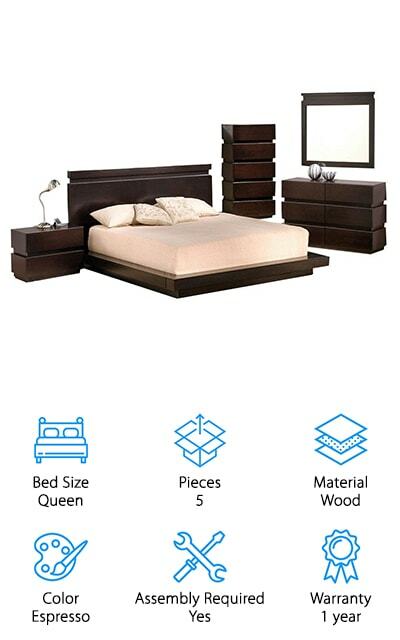 The Kings Brand Modern Bedroom Set includes a lot of modern bedroom furniture. What do we mean by that? This is a six piece set that has everything you need to completely redo your bedroom. It includes a queen headboard and footboard, dresser, mirror, chest, and two nightstands. Each piece is made of wood and has a beautiful light brown finish. One of the things you’ll notice about this set is that it includes a lot of storage. The nightstands each have two large drawers while the dresser has six and the chest five. Each drawer has a large, dark bronze drawer pull that looks great against the muted brown finish. This set is available in both queen and king sizes. Oh, and one more thing, there is some light assembly required.